Simple, easy with no cooking involved and can be easily adapted to your liking. Your guests will think you spent hours preparing. This is a decadent dessert and best served when not on a diet! 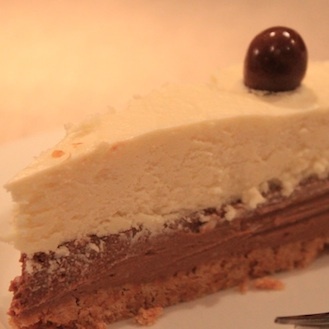 A delicious malt chocolate cheesecake that is no bake and takes 1 hour to make and 5 hours to sit. Spread the milk chocolate mixture evenly into the baking pan. It is recommended to wipe around the edge of the pan to give a clean and smooth edge. Gently spread the white chocolate mix over the top and gently smooth. Decorate with malted milk balls or chocolate swirl and chill for at least 5 hrs until firm. Another option rather than using malted milk balls is to keep a little extra milkchocolate mixture and swirl into the white chocolate top. This being a rich dessert for some so be sure to cut into 12-16 slices. Serving smaller slices and serving some fresh berries would be an excellent choice and provide an excellent presentation. You can make extra or freeze leftovers. Freezes very well.